Yesterday, Kozo updated the main site, adding reviews he wrote for Lover’s Discourse, Marriage with a Liar and Reign of Assassins as well as Kevin Ma’s take on The Road Less Traveled. I contributed three reviews this week, and here’s a rundown of the films for any interested parties. Despite a tortured production history and a non-traditional choice for its leading man, The Green Hornet turns out to be a welcome surprise, delivering an entertaining buddy comedy that successfully lampoons the superhero movie genre through a clever subversion of the conventional hero/sidekick dynamic. Stepping into shoes once filled by Bruce Lee, Taiwanese singer-actor Jay Chou shines in his Hollywood debut, taking the role of Kato and making it his own. To understand why I liked this movie — that’s getting panned left and right — you should read the review posted here. For its next-to-last horror film and the final entry in its prolific Dracula franchise, England-based Hammer Film Productions joined forces with Hong Kong’s Shaw Brothers Studio for one of the first cross-cultural, kung fu/horror mash-ups in cinema history. The result is a schlocky, largely goofy film made watchable not only by the welcome presence of the inimitable Peter Cushing and David Chiang, but also an intriguing subplot involving interracial love amidst a martial arts-infused vampire plague. Without a doubt, The Legend of the 7 Golden Vampires is the very definition of a cult classic. For those unafraid of the vampire’s kiss, you can check out my full thoughts on the film here. A rare coming-of-age story in which the hero simply fails to come of age, White on Rice is a peculiar, largely unsatisfying film that occasionally milks laughs from its immigrant manchild protagonist, but delivers little else. If you’d like to learn more about why I didn’t like this movie, you can take a gander at my take on White on Rice here. Kozo published another review of mine the other day, so I thought I’d talk a bit about it here. While coming home from OU Medical Center awhile back, I stopped in Norman to find a place to eat. Across the street from the Chinese place I’d chosen was Hastings, a video/music/book/video game/comic store that I tend to frequent anytime I come back to Oklahoma. 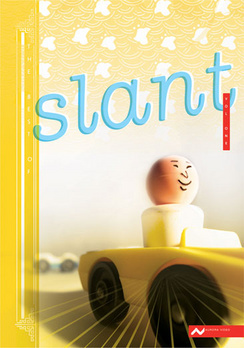 While browsing the “foreign film” shelves of the DVD section, I stumbled upon Slant, Volume 1, a collection of short films that aren’t foreign at all, as they’ve been created by a handful of Asian American filmmakers. It’s striking that an Asian American film collection gets shelved in “foreign film” section, but that’s a discussion for another time. The Best of Slant Vol 1 features a collection of short films culled from seven years of Aurora Picture Show’s annual Slant: Bold Asian American Images festival. The Slant festival annually showcases the best in emerging Asian American cinema. Since its start in 2000, Slant has screened an eclectic mix of films that explore a wide range of topics and genres such as the smashing of stereotypes, off-beat comedies, family stories, explorations of culture and identity, and universal themes like love, loss, the human condition. Slant curator Melissa Hung is the founding editor of Hyphen, a magazine about Asian American culture. She is a frequent speaker on the topic of Asian American media and independent media. She lives in Oakland, California and works for the San Francisco WritersCorps, a creative writing program for urban youth. You can check out my full review for LoveHKFilm.com here. I thought the better contributions made up for those that were simply lacking or just too quirky for their own damn good. For those of you curious about the anthology and perhaps unable to get your hands on it, check out Dino Ignacio and Rex Navarette’s contribution, Maritess vs. The Superfriends, one of the clear-cut gems of this eclectic collection.